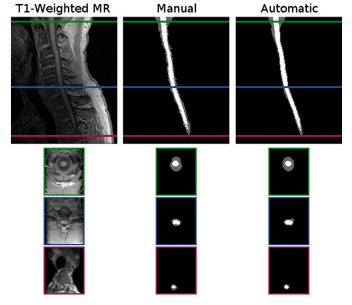 Difference between revisions of "Automatic magnetic resonance spinal cord segmentation"
Statistical atlas construction parameters: The impact of the two statistical atlas construction approached were evaluated by repeating our algorithm on five images from each cohort, while using atlases from both approaches with increasing kernel sizes ([[Image:ARMS_"o".png ]]) for the gaussian smoothing. 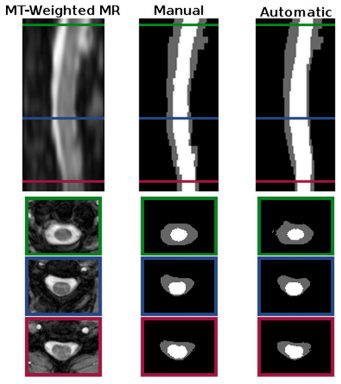 In general [[Image:ARMS_"o".png ]] can be seen as a parameter for controlling the capture range of the statistical atlas. For the registration approach, the best performance was achieved without any smoothing ([[Image:ARMS_"o".png ]] = 0). However, for our single segmentation approach, smoothing with [[Image:ARMS_"o".png ]] = 1 was necessary to achieve the best performance. 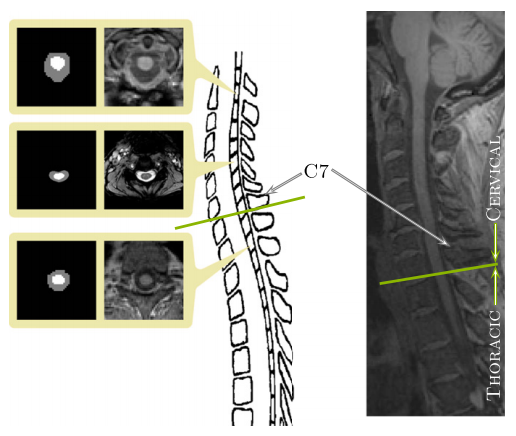 Both approaches had roughly the same performance at their respective optimal configurations, with our single segmentation approach performing slightly better in the CSF for the t1 data.